Unique Wood Serving Utensils (Pair), "Maya Cuisine"
Peten Wood Artisan Sculptors transform the rich grain of natural jobillo wood into an elegant pair of salad spoons. Grown in Guatemala, jobillo wood is a sustainable wood with brown to dark red and golden hues. 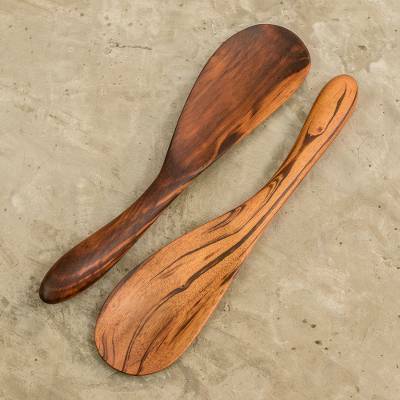 Please note that hot and/or spicy food may dye the natural wood, yet spoons can be filed and finished with oil to return to natural coloring.